There are a few steps a gardener can take to save a diseased oak tree instead of cutting it down. Although resistant to some extent, oak is susceptible to fungal diseases that can affect its appearance and health when left untreated. 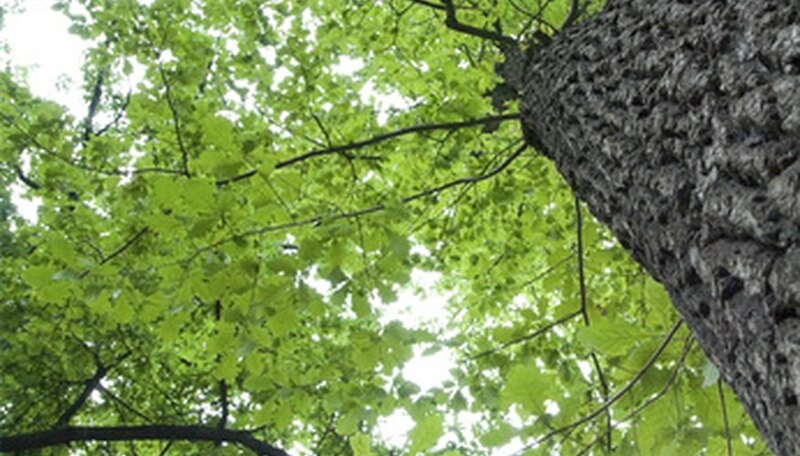 Although infections and treatment procedures vary, you can restore the tree back to health. The success of treatment depends on the extent to which the infection has spread, the level and quality of tree care and maintenance and the resistance of the oak tree. Spread a large tarp directly under the tree to collect cuttings. Inspect the tree thoroughly to determine the type of infection; whether it is on foliage, trunk or bark; and if it is concentrated in one section or spread all over. Snip off diseased branches or stems to prevent the infection from spreading to other parts of the oak tree. Discard or burn infected branches immediately. Also, rake and burn fallen leaves, as they may contain the infection. Spray the diseased sections with an appropriate fungicide. Follow label directions for use and precaution. Inject the tree with fungicide to prevent it from spreading through the vascular system, which could impede the passage of water and nutrients between the roots and the foliage. Reduce stress to save the diseased tree from dying. Water the oak tree frequently and feed it a well-balanced (10-10-10) fertilizer around the drip line every month during the growing season. Mulch the area around the tree to keep roots cool and weeds from growing there. Space the mulch 1 foot away from the trunk. Wear gloves when treating and handling a diseased oak tree. Clean pruning equipment thoroughly after use with alcohol to prevent the disease from spreading. Lack of care and maintenance increases stress and makes a tree susceptible to diseases. Water, fertilize and prune the oak tree frequently and remove weeds and pests. Inspect the oak tree frequently for signs of disease or decline. Signs such as yellowing, wilted or tattered leaves, bark cankers and dying back of crown or leaves are all causes for concern. Treat immediately to control it from spreading. Make an environmentally safe fungicide to kill the fungal disease on your oak tree. Add 1 cup hydrogen peroxide to 9 cups water and mix thoroughly. Pour into a spray bottle and spray over the fungus daily to eliminate it.